I'm considering selling my 2008 vvt JLX. in grey. I have had the gearbox rebuilt and everything works. It's standard with no off road mods. Apart from the gearbox/propshaft problem it's been fine. It's fitted with a double din satnav/dvd although I've never really got the radio working properly but that is more down to the poor Chinese (Chinglish) instructions lol. I mainly use an sd card with 8hrs of music on it. The screen tilts and the sd card, nav card, and DVD's are inserted behind the screen. I have the original radio/dash panel so it can be put back to standard. I also have a bare Swift sport engine which could be included in the deal. Anyway I'm not really wanting to sell it just yet but I was thinking of getting a newer small car as the Jimny doesn't really cover what I want anymore. If anyone is looking to buy a Jimny in the coming weeks/months keep me in mind and/or contact me with any offers. Almost forgot it's on a private plate so I'll need time to sort that out as well. Here's a couple of pics I put on the forum some time ago. Last edit: 10 Jan 2018 12:14 by gilburton. I don't know offhand but I wouldn't get one with the flip front as it's slightly over standard double din on the pivoting screen. I had a job trying to find a trim surround that would fit and I ended up buying another used panel and cut it and slightly enlarged a standard trim to tidy it up. It may fit other cars but there are plenty standard double din sized ones on ebay now at cheap prices unlike this one bought 2/3yrs ago. Very poor trade in prices of £2300 some dealers on ebay are wanting up to nearly 7k which is a bit OTT so somewhere in between would be a more acceptable privately. Is your Jimny still for sale? If so, have you had any offers / interest in it? 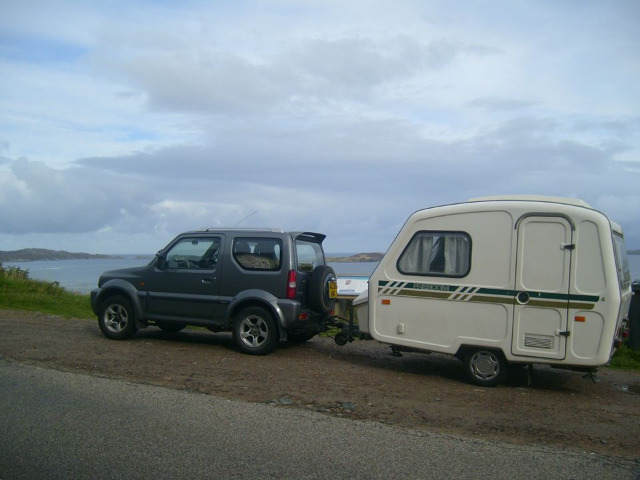 How much towing has it done with your caravan? Yes I've still got it but don't wait for me as I'm still not in a position to sell. If/when I am I'll relist it.